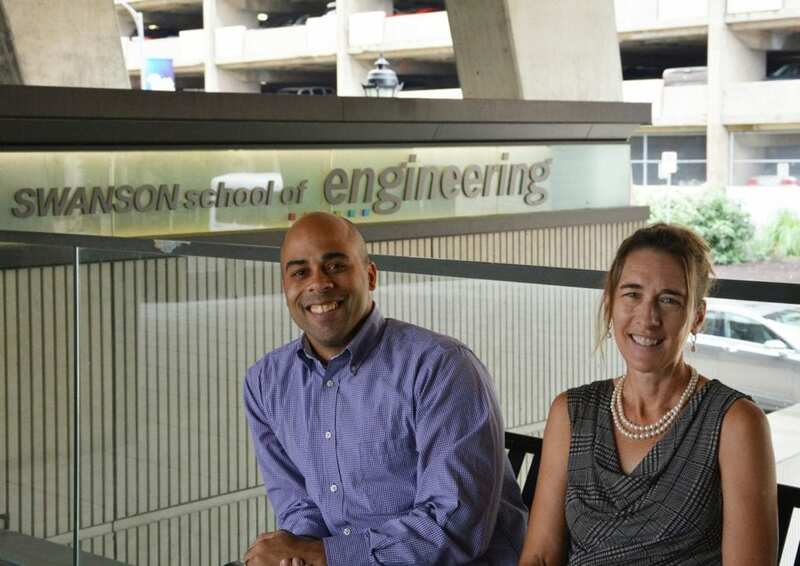 PITTSBURGH (September 25, 2018) … University of Pittsburgh professors Samuel Dickerson and Renee Clark received an NSF grant to help students in the Swanson School of Engineering start to think about thinking. The two-year, $200,000 award will support a project to improve learning and development by promoting the frequent use of reflection and "metacognition" among students in the Department of Electrical and Computer Engineering. Dickerson, an assistant professor of electrical and computer engineering, believes that the Swanson School is perfect for this kind of project. "Engineering is different from other disciplines because this type of thought process isn't inherent in our training," he said. "Reflection and metacognition are not skills that are regularly cultivated or practiced in the engineering curriculum – in the classroom we are more focused on immediate problem-solving rather than pausing and looking at the big picture, which is more common in the engineering workplace." They hope to change that standard at Pitt by first introducing these skills to electrical and computer engineering students in Dickerson's ECE-0257 microelectronic circuits course. According to Clark, assistant professor of industrial engineering, it is easier for a student in a classroom environment to ask a professor or teaching assistant to help them solve a problem. Outside of college however, there may be fewer resources on which to rely. Dickerson and Clark want to encourage engineering students to develop lifelong learning skills that will help them independently learn how to find a solution and ultimately give them an advantage when they join the workforce. "When a student faces an obstacle in class or doesn't perform to the level he/she should, we don't typically ask them to critically reflect on how they got there, what they can do to solve it, or how they can perform better," said Clark, who is also director of assessment for the Engineering Education Research Center (EERC). "Our goal is to utilize frequent activities that prompt students to reflect and better understand their learning processes." "Metacognition is a useful skill that helps students take a deeper look at their learning processes by simply thinking about their thinking," said Dickerson. "Reflection is a closely related skill where students are asked to critically analyze something they have done. In this project, we want to encourage students to use both metacognition and reflection to guide their own learning during new tasks." A unique aspect of their research is the use of SPICE simulation tools to drive students to analyze their work and gain insight into success as well as mistakes. "I will ask the students in my class to use engineering theory to complete a problem and then compare their answer to a computed result using SPICE, the standard simulation environment used by professionals to predict electronic circuit behavior," explained Dickerson. "I want them to reflect on the gaps in their understanding, thereby taking a deeper look at their learning process and understanding." Dickerson and Clark will examine the impact of frequent reflection using SPICE by looking at both quantitative and qualitative data. In addition to monitoring exam scores, they will distribute surveys, conduct interviews, and hold focus groups. They will be using a system to measure the depth of the students' reflections and will evaluate the content to see if it is showing growth in students' professional development. "The results we are looking for are not necessarily better exam scores," said Clark. "We want to know if we have cultivated reflective and metacognitive skills in engineering students and if we have made an impact on their development. We will be analyzing both the depth and content of their reflections using a systematic approach that has been working for us in our preliminary research." With the use of these skills, Dickerson and Clark hope that ECE students will become better students, learners, and professionals by developing the ability to critically reflect on their own performance. These types of reflective activities are applicable across disciplines and can be easily implemented in any classroom at the University. Clark said, "We hope that these efforts will help our students develop lifelong learning skills that will make them better prepared for the professional world."